Hi, I just recently got my first car, a 2000 406 Estate, and there are some problems with it, and the biggest problem with the car, as it has ran for 400k km, is that the speakers are old, worn out and ready for their replacement. 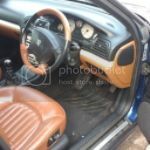 I have already looked a bit into the removal of door cards and how to replace the speakers there, but my main problem is that I can't figure out how to take out the tweeters in the dashboard and the speakers in the boot, maybie someone can provide sone help to me. The rear speakers are in the pillars, if you peel back the boot rubber seal on one side, I think the grey cover pops off, no screws, but be careful of the top plastic strip as it's clips are flimsy.. 2 torx screws hold the speakers in. If you want better rear speakers, there are 2 6 inch cut outs in the tailgate unde the grey cover, you just need to cut holes in the grey cover afterwards. I think the front all range speakers can be removed by prising off the plastic cover this will expose the screws.